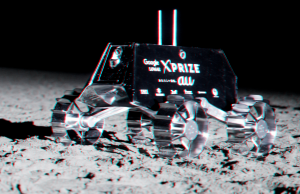 This year, Google’s Lunar XPRIZE (GLXP) competition ended without a winner. None of the private companies involved in the challenge were able to make it to the Moon before the March deadline. But one of those companies, called ispace, isn’t ready to give up on its lunar ambitions just yet. It’s now working with SpaceX, Elon Musk’s space exploration company, to deliver a pair of robotic rovers to the Moon’s surface in 2021.
ispace is a Japanese lunar exploration company that managed Team HAKUTO, one of the final five competitors in the GLXP. Its goal, like its competitors, was simply to get a rover on the Moon. Now, it’s hoping scientists (or anyone who wants to) will pay to use the lander and rovers it developed for the competition. On Wednesday, ispace announced that it had selected SpaceX to transport its Lunar Lander and Lunar Rovers to the Moon. According to the plan, SpaceX will use a Falcon 9 rocket to place ispace’s Lunar Lander in the Moon’s orbit in mid-2020. Then in mid-2021, a lander will gently deliver the Lunar Rovers to the Moon’s surface. While Team HAKUTO may have missed out on the $30 million GLXP winnings, ispace has already raised more than $90 million. The goal of these missions is to demonstrate its ability to successfully navigate the Moon’s surface. If successful, ispace could make even more money as the contractor of choice for anyone looking to explore the face of the Moon. More on Lunar XPRIZE: Google’s Lunar XPrize Is Over. Spaceflight Innovation, However, Is Not.